The Saturday Night Live host also wore a Soviet hockey jersey that read "Trump." Saturday Night Live host Don Cheadle used his platform and wardrobe choices to send a few pointed messages this weekend. Later, Cheadle closed the show wearing a Soviet hockey jersey with “Trump” on the front and “45” on the back, leaning into Donald Trump’s alleged ties with Russia and Vladimir Putin. 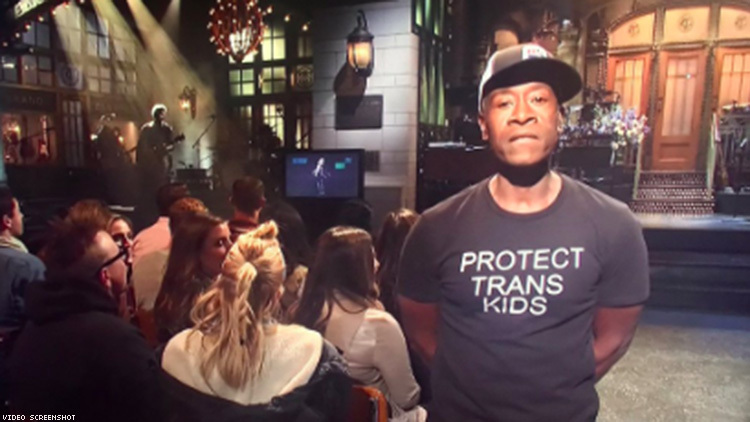 Cheadle didn’t make a statement about his “Protect Trans Kids” shirt at the time, but the gesture was roundly praised on Twitter for his calling attention to a vulnerable, underrepresented segment of the population. His message of protecting trans people juxtaposed with one about Trump’s duplicity was pointed. Trump and his administration have continually targeted vulnerable trans people with the military ban and rescinding protections for trans kids in schools. Human Rights Campaign President Chad Griffin, trans activist Charlotte Clymer, the National Center for Transgender Rights, PFLAG were among those who praised Cheadle for sending the message.